Thanks for visiting the Credit Dot. 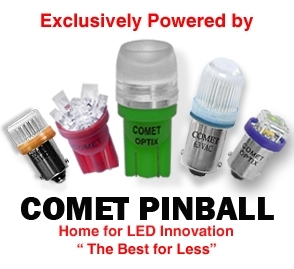 Credit Dot Pinball was founded in April 2014 after much deliberation–and mild dissatisfaction with the lack of in-depth opinion articles dealing with pinball related topics available on the web. I’m the author of the posts and the conductor of the interviews around here…my name is Rob. I’m a pinball hobbyist, which is another way of saying I own pinball machines but stink at playing them. I bought my first pin (Solar Fire) with the money I earned from my first job at fifteen years of age, and was also lucky enough to have a steady supply of free tokens from local arcade throughout my entire childhood. I now live just outside of Toronto, Ontario, Canada, and I am a member of a fantastic pinball community that congregates at both The Montreal Arcade and Amusement Collectors Association and Pinball Revolution . My current lineup includes Pin*Bot, Fire!, Elvira and the Party Monsters, Rollergames, Funhouse, Creature from the Black Lagoon, The Addams Family, White Water and Demolition Man. I’m also currently restoring a Gottlieb Charlie’s Angels, which is my first foray into a full blown restoration, and the first game I’ve owned that didn’t carry the name Williams/Bally on the backbox. Transporter: The Rescue is currently at the top of my want-list. I have a fantastic wife who supports my addiction however she has limited the number of machines in my collection to seven (if you do the above math, I’ve run out of room, I need to tread VERY lightly now). I can be found on the more popular pin message boards and other pin-related media under the pseudonyms “spiroagnew” or “Rod McLarge”. Great blog! Appreciate the in-depth posts. Keep it up! Congrats on the pinball blog! Keep the interesting articles a coming.